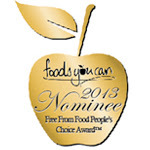 A very exciting email has landed in my inbox turns out my blog has been shortlisted in awards run by Foods You Can. The Free From People's Choice Awards enable people with allergies/intolerance to vote for brands they enjoy and this year a blog category has been added. Here's where I kindly ask for your help. If you think my blog is worth voting for then you can cast your vote HERE. Voting opens on the 1st of September 2013 and will run until the 30th of September 2013. Also its not all about my blog make sure you vote for your favourite Free From products. Each person that votes can be entered into a free prize draw to win a £100 food shopping gift voucher. Thanks in advance for your support, I'm up against some amazing blogs but I have my fingers crossed. Well congratulations! I'm off to vote for you. Done! Congratulations and good luck! Congratulations and good luck! :-) I have of course voted for you, - really hope you'll be the winner!